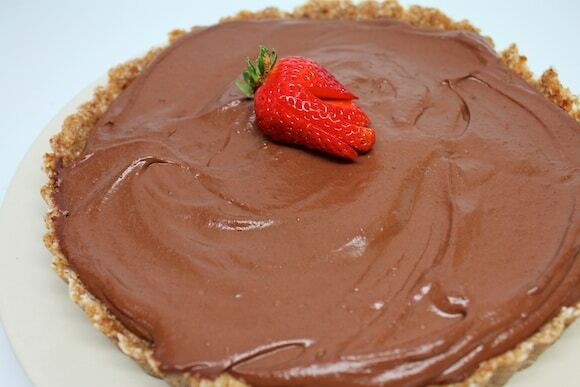 This recipe for Vegan Peanut Butter Chocolate Pie is so luscious. Nobody will ever believe it’s refined sugar-free and gluten-free! That’s it! 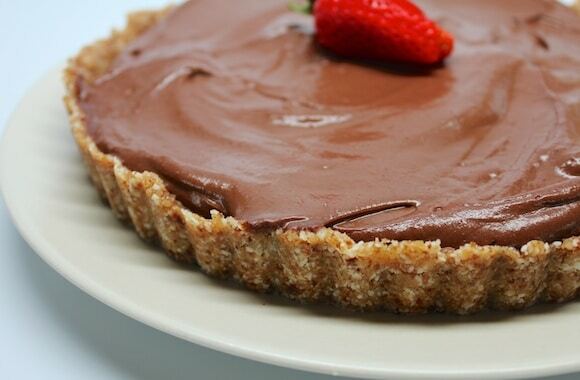 I can’t believe how easy the no-bake crust for this pie is. You just have to add the three ingredients to a food processor. After you process the ingredients, you then press them into a tart pan with a removable bottom. 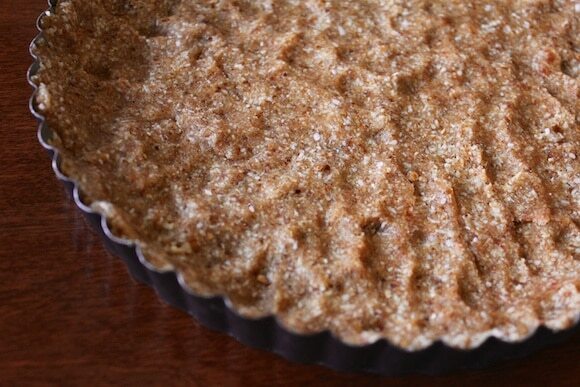 You could use a glass baking dish, but I kind of like the drama of removing the pie from the tart pan. It’s totally your choice. 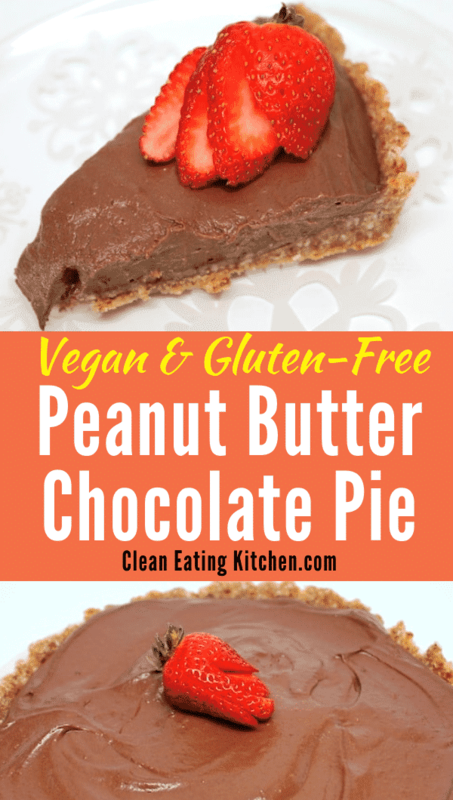 This pie is vegan and dairy-free, so the filling gets made using silken tofu. I don’t eat a ton of soy products anymore, but I make an exception for this pie. I just used my blender to process the ingredients for the pie filling. The last step is to pour the filling into the pie crust and then let the pie chill in the fridge for two hours so it can firm up. 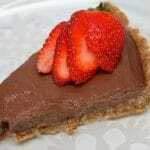 When you’re ready to serve, feel free to top each slice with a fresh strawberry or some coconut whipped cream. 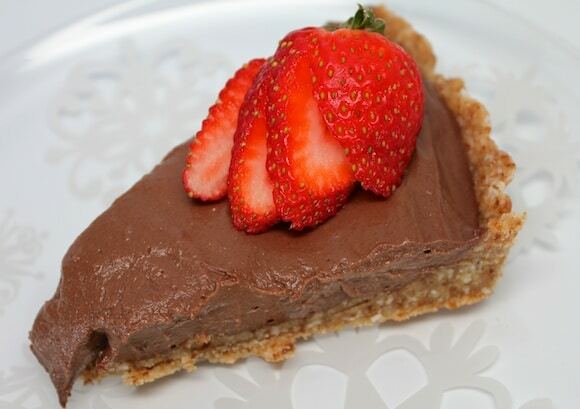 A vegan, gluten-free dessert sweetened with dates and so delicious. 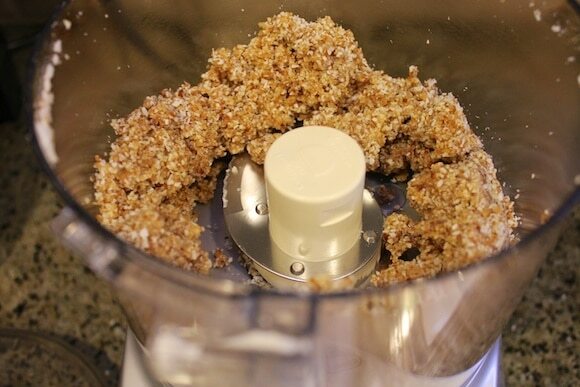 Crust: Combine the coconut, almonds, and salt in a food processor and pulse until the nuts are finely ground. Add the dates, 2 to 3 at a time, pulsing between additions until well-incorporated and the mixture is crumbly but slightly sticky. Transfer to a 9-inch pie plate or tart pan with removable bottom. press the mixture thinly, firmly, and evenly onto the sides and bottom of the pan. Place the pan in the refrigerator while you make the filling. Filling: Combine tofu, dates, vanilla extract, cacao, peanut butter, and soy milk in a high-speed blender and process until smooth. Use the tamper if necessary to push the ingredients into the blade. Pour the blended mixture over the crust and use a spatula to smooth the top. Place entire pie into the refrigerator for at least two hours before serving so filling can firm up. This might just be the best pie that I’ve ever made. The raw crust recipe is fantastic and it held together really nicely, plus had the perfect amount of sweetness and great texture. I only make it on special occasions, but it’s so pretty and yummy that everyone always loves it. Thank you so much for all the kind words about Practically Raw Desserts, Carrie!! I’m so thrilled you’re enjoying the book! You really need to get vegan delish for android phones!!! Thank you for your interest, Kara. I hope so!!! What kind of dates do you buy? We really only have 1 brand that I can find in our area and it’s like $5 for the amount it would take to make these delicious looking pies. I know it’s worth it but I was wondering if you had any date secrets. Hmm, we have a couple of bulk stores around here. Maybe I’ll give that a shot. Thanks. Oh this cookbook sounds amazing!!!!! I’ll have to check it out. 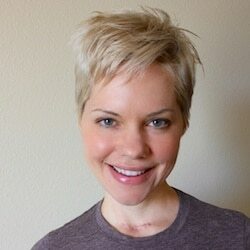 I have really enjoyed Amber’s first book, Practically Raw, so this is really exciting! I know what I”ll be ordering next. Can’t wait to try some of her (and your) desserts. Since I’m following the ETL plan, am I okay to have small portions of things like the pies you’re showing here? Or should they be saved for rare occasions. Still finding my way. Thanks Carrie! Can you bake these pie crusts? I have a pumpkin pie recipe that needs baking and I was wondering if i could use these crusts instead of an oat pie crust I currently use which I am not very fond of. The pumpkin pie needs to be cooked for about an hour and 15 minutes. Mmm these pies look amazing. I’m on a Living Below The Poverty Line challenge until Friday but as soon as I finish I’m going to need a treat. These look perfect! Speaking from experience, once you’re at Amber’s house, spending time with her absolutely becomes far more important than eating ever could be. She is a most magnificent lady and a thousand times more beautiful than this raw tart… and we all know that’s saying a lot! I wonder how subbing peanut butter made with peanut flour would do here? Chocolate peanut butter pie was absolutely put of this world good. The big problem is I ate most of it in 2 days with a wee bit of help from my sister in law. I only used 1 cup of dates in the filling and it was plenty sweet. I used 10 dates in the filling and 10 in the crust. I could have cut the sweetener in the crust too and still loved it. I want to figure out a way to do this and have it still hold it together. Hi Kathleen! Thanks for the feedback. Which part didn’t hold together well, the crust or the filling? Sorry I wasn’t clear, everything was perfect. I would like to reduce the dates in the crust for my own sake since I have a raging sweet tooth and am worried about it staying together. It was divine, truthfully. Hi Kathleen! I agree, I have a problem with too many dates. I have found that even using water to help moisten the crust without as much dried fruit works pretty well. Want to make this soon and I need to clarify what the cacao is. Actual chocolate or powder or something else? Just want to make sure I get it right! Thanks! One of my all-time favorite desserts!